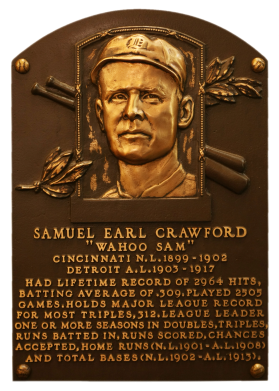 Sam Crawford played outfield for Detroit alongside Ty Cobb. 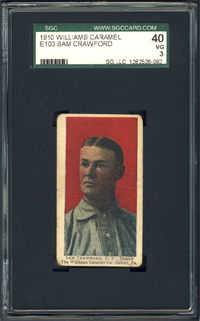 The powerful Crawford is baseball's all-time leader in triples with 309. A native of Wahoo, Nebraska, "Wahoo Sam" retired only 39 hits shy of 3,000. He hit .309 lifetime, with 1,393 runs scored and 1,525 RBI. He later returned to baseball as an umpire in the Pacific Coast League. 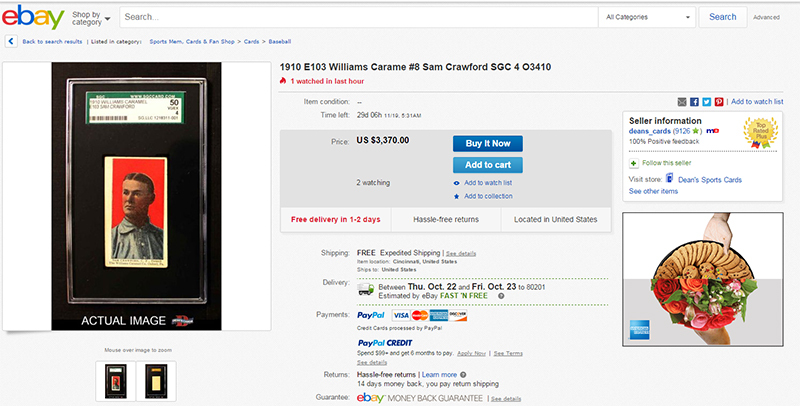 Comments: I purchased a raw 1911 M116 card in January, 2003 and then upgraded to a GAI 4.5 with another eBay win in July, 2004. In December, 2005 I decided to diversify and pick up a new type card. I won an eBay auction for a SGC 10 1910 E103 from Bryan Long (trib01). I upgraded to a PSA 1.5 with an eBay win in February, 2010 from TNT Collectibles (steeler-man). The card had interesting notepaper marks on the reverse as if had been glued into a scrapbook at some point. The seller indicated the card came from a lot where other cards had similar markings. In June, 2010 a hobby friend Brian Terjung sold me this SGC 40 example. Thank you sir! 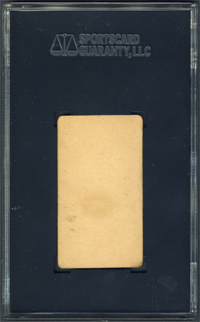 Description: This 30-card set issued by the Williams Caramel Co. of Oxford, Pa., in 1910 can be differentiated from other similar sets because it was printed on a thin paper stock rather than cardboard. Measuring approximately 1-1/2" X 2-3/4", each card features a player portrait set against a red background.